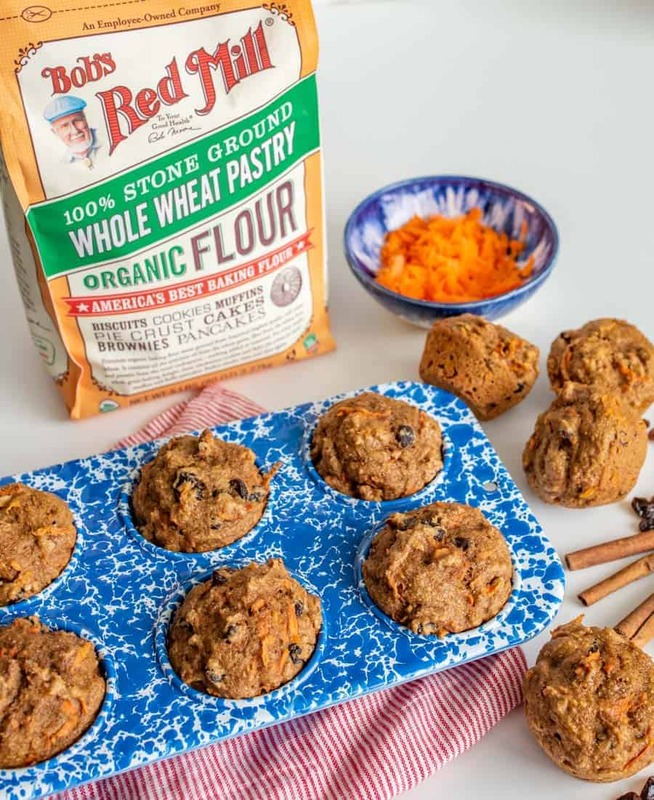 Healthy Carrot Cake Muffins are a nourishing spin on a springtime classic and have all the flavors you love in carrot cake (raisins, nuts, carrots), plus you can get away with having them for breakfast. And that’s just a win-win. 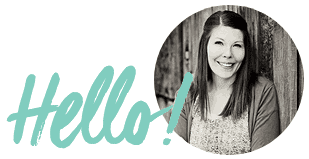 I’m partnering with one of my favorite clients for this recipe today! 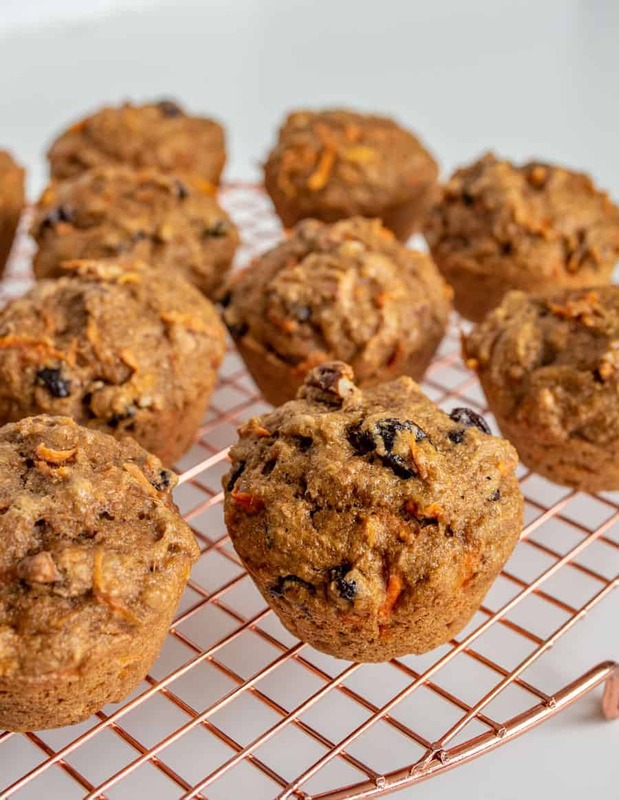 These muffins are made with Bob’s Red Mill whole wheat pastry flour, coconut oil, honey for the sweetness, raisins, nuts, and, of course, carrots. They’ve got all the goodness of carrot cake, but you can have them for breakfast! I’d recommend warming them up a bit and serving them as pre-egg hunt sustenance for kiddos and adults alike. If you’d rather save them for dessert (or have them in the morning as well as the evening–hey, I wouldn’t blame you), add a layer of simple cream cheese frosting (recipe below) to turn your muffin into a makeshift cupcake. 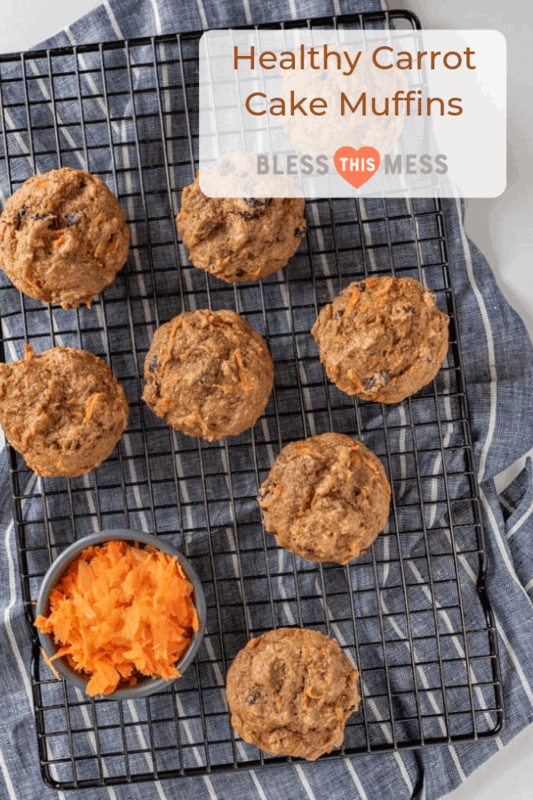 These muffins are so great and so versatile that even carrot cake naysayers are sure to love them! Moist, filling, and packed full of your favorite spring flavors, you’ll surely have several happy bellies at your springtime celebrations. Have you tried whole wheat pastry flour before? It’s magical! It’s made from a soft white wheat berry (that’s what the kernel of wheat is called). It has all of the nutrition of whole grain whole wheat flour, but it yields a lighter and fluffier product than traditional whole wheat, which makes it perfect for muffins, cookies, and other baked goods. 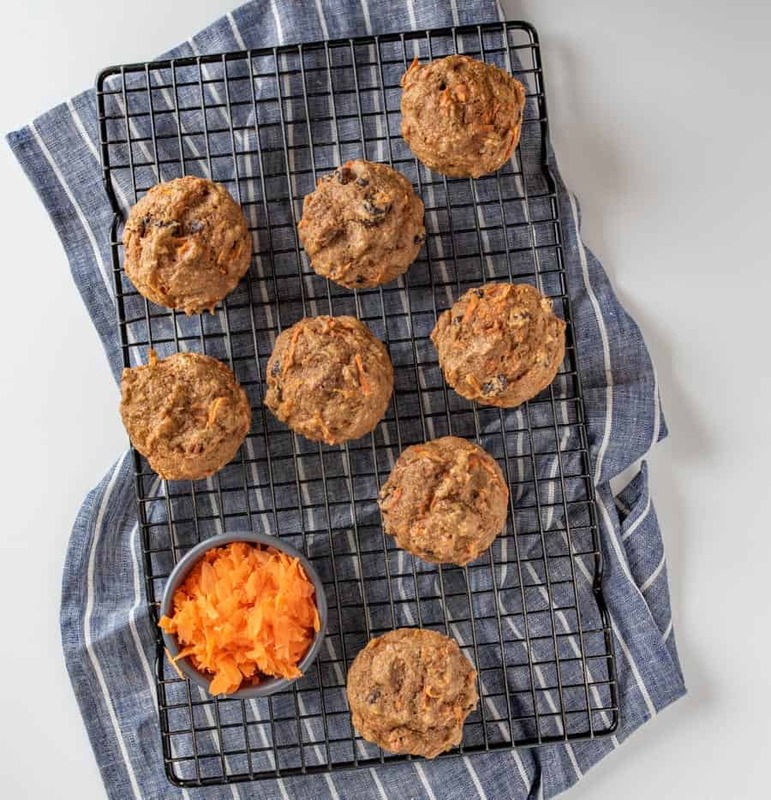 How do you store Healthy Carrot Cake Muffins? These guys are nice and moist, and you want to be sure you store them in a way to preserve that great texture. Let the muffins cool completely before transferring them to a sealable plastic bag or airtight tupperware container. Seal the bag or close the container before putting it in a bread box or cupboard. Putting them in the fridge will take away from the flavor, so leave them in a room temperature area. They’ll stay fresh for up to 4 days. 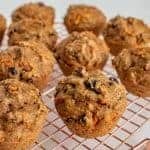 Can you freeze Healthy Carrot Cake Muffins? Yes! To freeze them, follow the same instructions for storing them, but wrap them in aluminum foil to maintain their moisture before putting them in a plastic bag or tupperware in the freezer. They’ll keep for up to 3 months frozen. Is there a cream cheese frosting you could use on these carrot cake muffins? Cream the cream cheese, honey, and vanilla together until light and fluffy. Add milk to reach a spreadable texture, and beat 3 to 4 minutes. Spread over top the cooled muffins. Preheat the oven to 350 degrees F. Lightly spray a 12-cup muffin tin with cooking spray. In a large bowl, add the coconut oil, honey, applesauce, egg, and vanilla extract. Stir well to combine. Add the flour, baking soda, cinnamon, nutmeg, and ginger. Stir until just combined. Gently fold in the carrot, raisins, and pecans. Divide the batter evenly among the 12 cups of the muffin tin. Bake for 18 to 24 minutes, or until a toothpick inserted into the center comes out clean. Let the muffins rest in the pan for 5 minutes, and then remove and let them finish cooling on a wire rack. Eat warm or at room temperature. These muffins freeze great and will stay fresh covered at room temperature for 3 to 4 days. Not a fan of nuts or raisins? Leave them out! 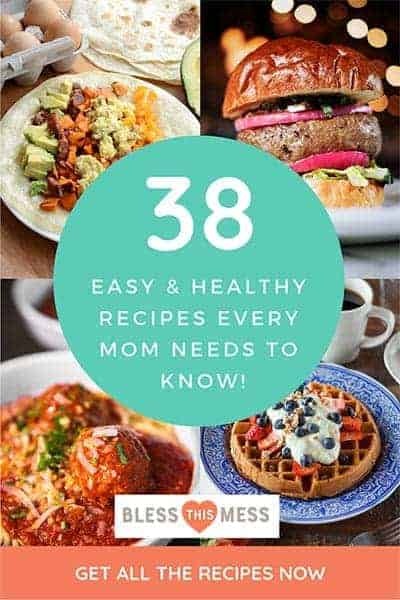 But they are SO good in this recipe that I think you should try it. Bob’s Red Mill traditional whole wheat flour (comes in a tan bag) will also work well in this recipe. I’m so excited to be working with Bob’s Red Mill today. I’m a long-time fan and customer of this employee-owned company. They embody so much of my own passion and joy when it comes to eating and feeding people well. It’s an honor to be working with them this whole year, and I hope you love the recipes I create using their products. Ohhh, I can’t wait for you to try these. They sure didn’t last long after school the day that I made them, and even our picky neighbor kids dove right in and loved them. Disclosure: This post is sponsored by Bob’s Red Mill. Thank you for supporting the brands that I love and choose to partner with.